Chrome-tin (either from the raw materials or a stain) pink and red glazes can be difficult to achieve and keep consistent at cone 6. 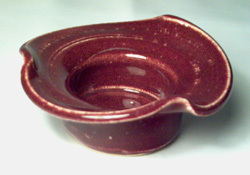 In ceramics, red is perhaps the most difficult and most expensive color in ceramics. The chemistry of the host glaze has to be sympathetic to the color development, the chrome and tin require high calcium, zero zinc and low boron (if the chemistry is wrong the color will likely be grey). Glazes that do work in this system are normally highly fritted, and as such are more expensive and difficult to work with. However this Ravenscrag base has beautiful working properties, you can do multiple layers and it has all the other benefits imparted by a high Ravenscrag Slip content. However, keep in mind that red is red, it is difficult; test this first on different kinds of clay to determine if is is suitable for you. Again, remember that tin is expensive, it may be better to use a pink or maroon chrome-tin based stain instead (although they are not much lower in price). Medium to medium thick application is best. Breaks clear around edges to highlight irregularities in the surface. On darker bodies the red color is darker. Slow cooling can matte the surface. Made using chrome and tin added to the cone 6 Ravenscrag clear base glaze recipe. The body is Plainsman M340. This is a good alternative to trying to get a chrome-tin pink or maroon working. 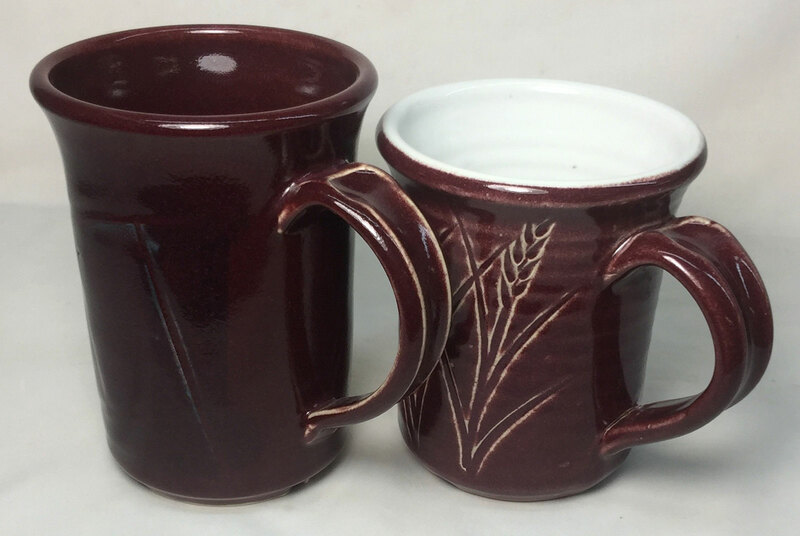 The Ravenscrag Slip based burgundy glaze on the outside of these mugs is made by fluxing Ravenscrag with 20% Ferro Frit 3134 and adding 10% Mason 6006 burgundy stain (actually these have a little less stain, about 8%). This stain works better than using raw chrome and tin. This glaze functions very well on porcelains and breaks white on the edges to highlight contours. 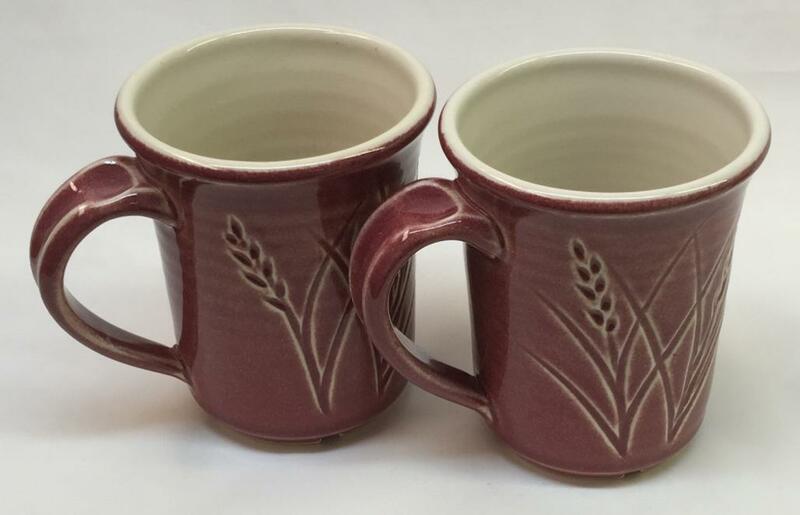 These are Plainsman P300 mugs fired at cone 6. 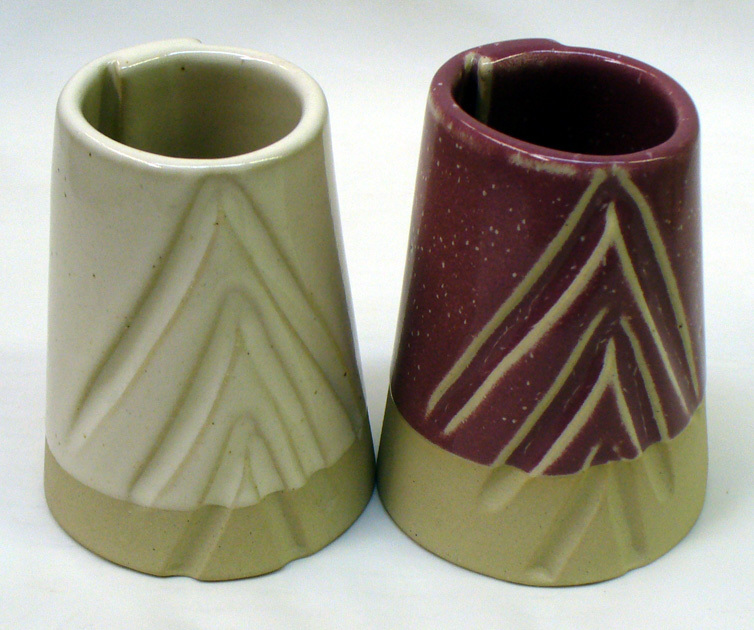 When the glaze, GR6-E, goes on too thick (as on the left) it is dark maroon and has a pebbly surface that does highlight contours. This went on too thick because the specific gravity of the slurry was too high, about 1.53 (even a one-second dip put to thick a layer on the pieces). When I thinned it down to about 1.45 and flocculated it using espom salts, it went on thinner, yet still evenly, and I got the result on the right. 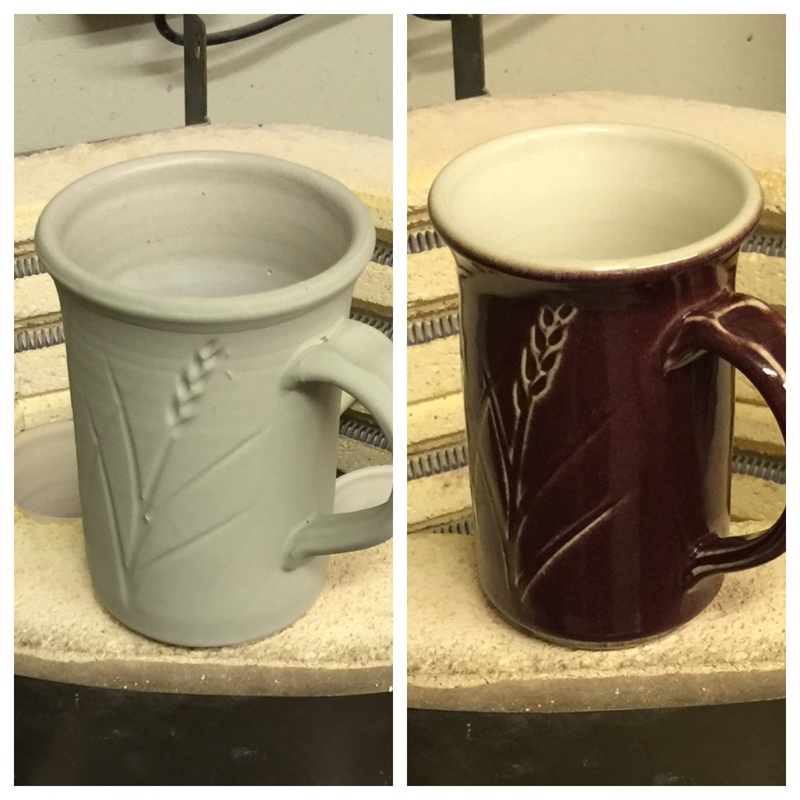 A stain-based method to achieve this color using the Ravenscrag base recipe.